I love broccoli and cheese soup, but it’s just not filling enough for my husband to eat for dinner. I decided to add a little twist to my favorite soup flavor, and make it a protein packed, main dish. 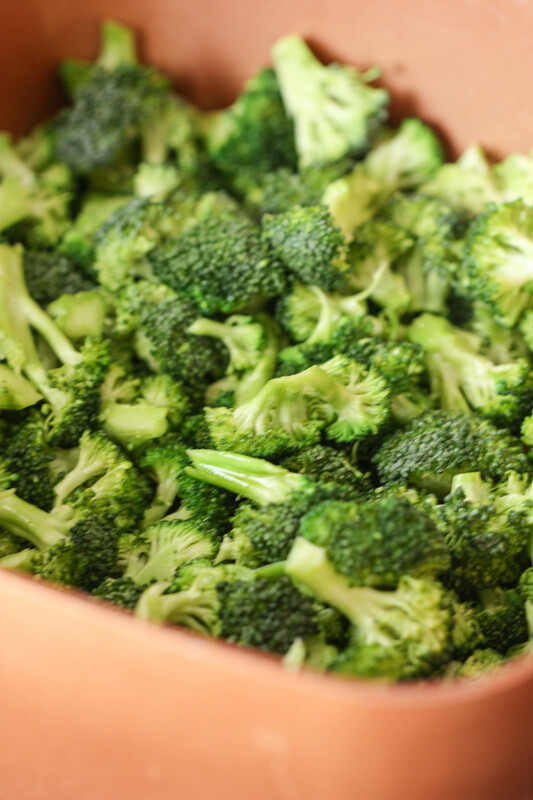 This idea created the masterpiece of….Cheesy Broccoli Chicken Skillet! This recipe is easy, delicious, and doesn’t require a lot of dishes, just a pan! I made this for the first time a few weeks ago, and my husband keeps asking me to make it again. I think this will definitely find it’s way into the meal rotation! If you don’t have a large enough pan or skillet to cook all the chicken breasts at one time, you can also cook this in a 9×9″ or 9×13″ pan. I’ve tried it both ways, and they both work. If you use a 9×13″ pan, the chicken won’t be as crispy, but will still taste delicious. You will also need to cook it a little longer (about 15 extra minutes) if you are only cooking them in the oven. 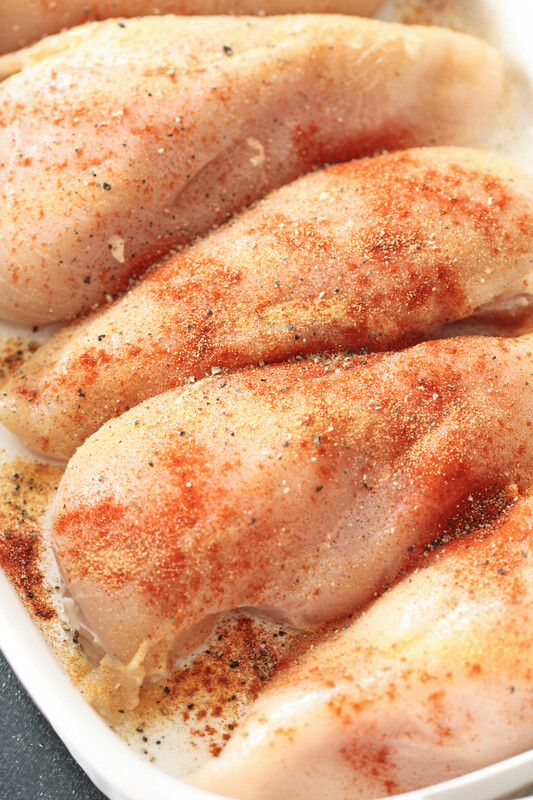 Start by seasoning the chicken with salt, pepper and paprika and combine the sauce while they cook. You can add the sauce one ingredient at a time, but I prefer to mix my sauce together so it is fully mixed and incorporated. Bake the chicken and add the cheese. You can use any cheese for this recipe. I prefer to use cheddar, but it would also be delicious with mozzarella, Colby Jack, or even pepper jack cheese. 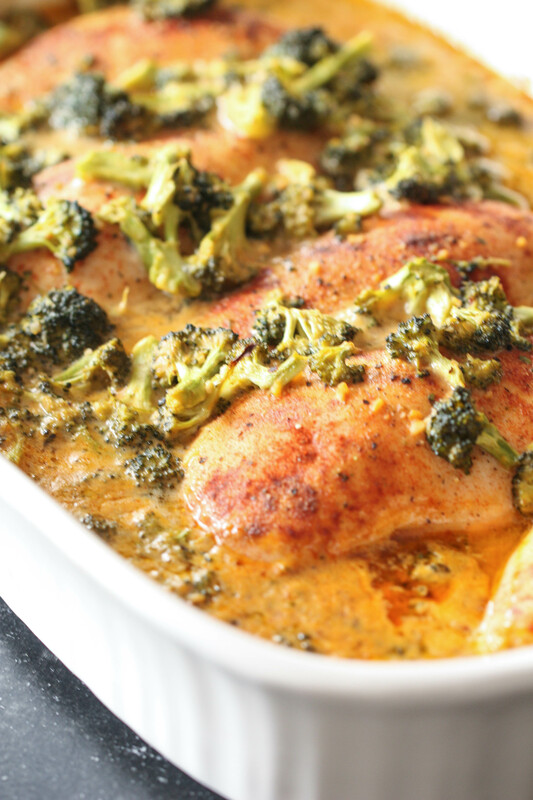 Another fast-meal alternative to this recipe, is using pre-cooked and shredded chicken, adding the sauce, and separately steaming the broccoli. You can then mix it all together, heat it up, sprinkle cheese on, and pour it over rice. It tastes delicious and the chicken gets a little extra sauce on each bite. This meal freezes very well. I would recommend not freezing the rice but rather cooking some right before you eat it. Place all the ingredients in a ziplock bag, cooked or uncooked. If you place the raw chicken in, I would recommend using a slow cooker and letting the frozen meal cook for about 6 hours on low. Season chicken with salt, pepper and paprika. Set aside. Heat large pan to medium-high heat. Place the chicken in the pan and cook for 5 minutes on each side or until the chicken is browned. I usually keep my lid on to trap the heat and keep the moisture in the chicken. Remove the chicken from the pan, cover and keep warm. In same pan you used for the chicken, add the garlic and cook until garlic is lightly brown and fragrant. Whisk in the cream of chicken soup and greek yogurt. Cook until the mixture is hot and bubbly, then turn the heat down to low. Add chicken and broccoli back into the pan. Sprinkle cheese over the chicken and broccoli and cover it with a lid. Cook for another 10 minutes or until chicken is cooked through. Serve with rice or pasta. Garnish with chopped parsley.